The quick, easy and safe way to clean all patios, driveways, decking, walls, concrete and tile roofs - and keep them clear as well by helping to prevent regrowth. No more back-breaking scrubbing, brushing or water-consuming pressure washing. 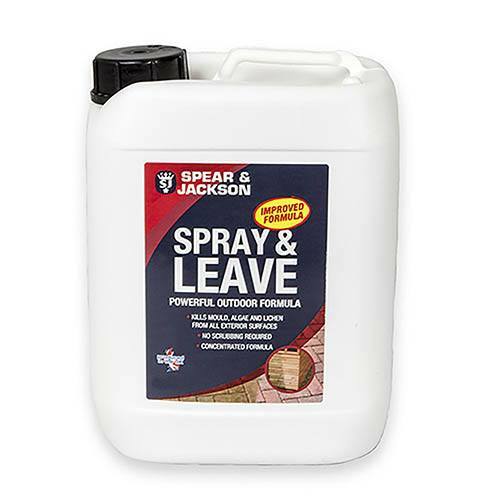 All you need to do is - Spray and Leave. That's it!! The special formulations targets all the usual problems of dirt, moss, algae, lichen and mould on all stone surfaces - results within 3-4 days. Supplied as a 2.5L concentrate, to be diluted as per instructions provided. The quick, easy and safe way to clean all patios, driveways, decking, walls, concrete and tile roofs - and keep them clear as well by helping to prevent regrowth. No more scrubbing, brushing or pressure washing. All you need to do is - Spray and Leave. That's it!! The special formulations targets all the usual problems of dirt, moss, algae, lichen and mould on all stone surfaces. You will see results in 3-4 days. Supplied as a concentrate, when you come to use it simply dliute down 5:1 with tap water, and apply using a pump action sprayer or similar. Each litre of concentrate covers 20-40sqm (200-400sq.ft), depending on the surface and how dirty it is. Fast acting, you can use the surface again once it is dry, and it is safe for children and pests once dry too. Do avoid contact wiith living plants and lawns though. Supplied as a concentrate to dlute 5;1 with water. Apply with sprayer or watering can with rose. Contains Benzalkonium Chloride 6.25% w/w, for use as a surface Biocide. Safe for pets and children once dry. Wash hands after use.